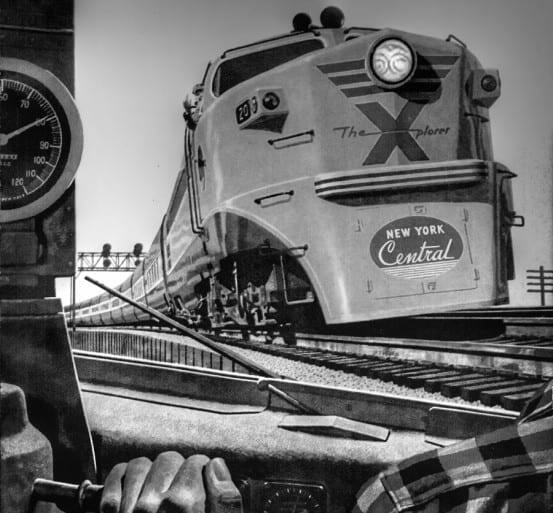 The New York Central’s Xplorer, as shown in a 1956 edition of Popular Science. 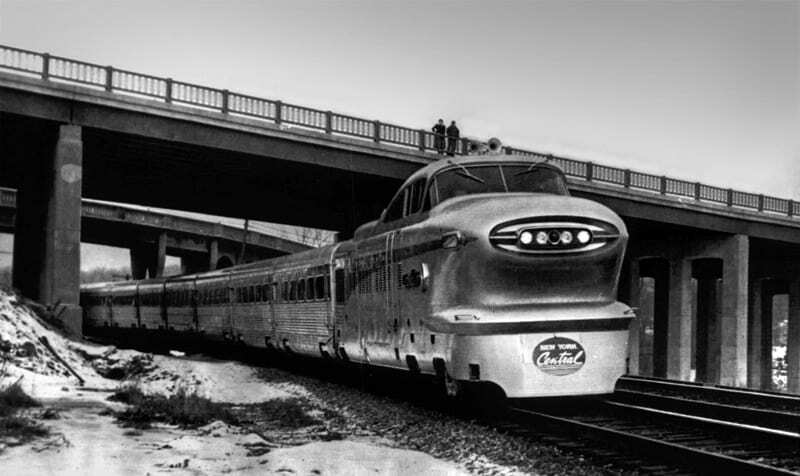 The Xplorer was one of many trains designed to be “high speed” in the United States, in this case, high speed was 120 miles per hour. Running from Cleveland to Cincinnati, the goal was a smooth train that banked into turns. Alas many said the ride was actually rather rough. A similar variant was produced for the New Haven, and ran into Grand Central. Also falling under the category of bizarre-looking trains is the Aerotrain. Built by GM, a particular focus was placed on looks, leading to a rather unique aesthetic. Used by the New York Central between Cleveland and Chicago, the “lightweight with a heavyweight future” failed to gain popularity. Passengers found the ride rough and the cars uncomfortable. After only a few months, the New York Central’s Aerotrain went to Union Pacific, where it ran between Los Angeles and Las Vegas. 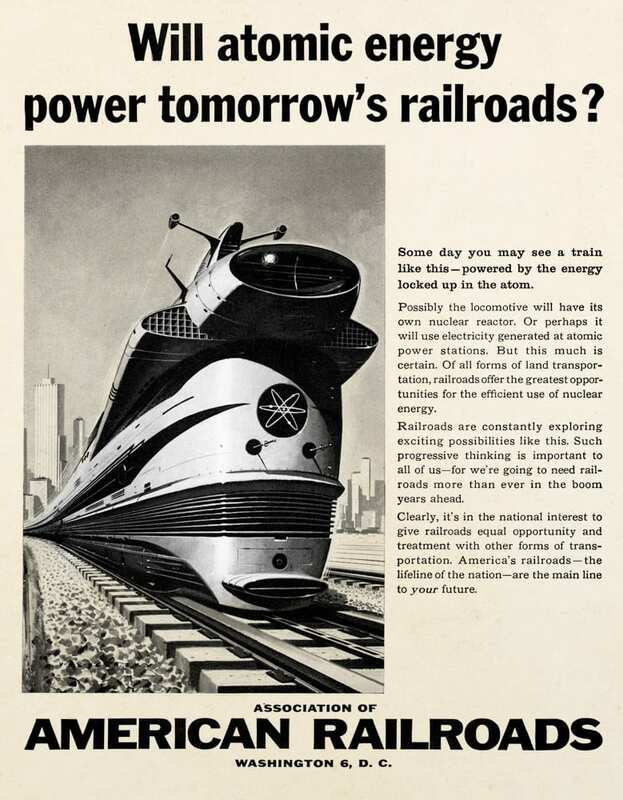 Will atomic energy power tomorrow’s railroads? Although the aforementioned trains may fall under the category of bizarre, none can really claim the title of strangest train ever conceived. That honor may go to the X-12. Picture the AeroTrain shown above, but put a nuclear reactor inside it – that is pretty much the X-12. Thought up by physicist Lyle Borst and his students at the University of Utah in the 1950s, the X-12 was a concept for a nuclear-powered train. Though that sounds a little bit outlandish today, one must think of the climate during the early years of the Atomic Age. Some of the world’s brightest minds had come together to discover the secrets of the atom, culminating in the first atomic bomb. That bomb caused unprecedented death and destruction. Who would want that to be their legacy? Thus many scientists involved in the bomb later focused on the peaceful applications of the atom, and something more worthy to be remembered for. 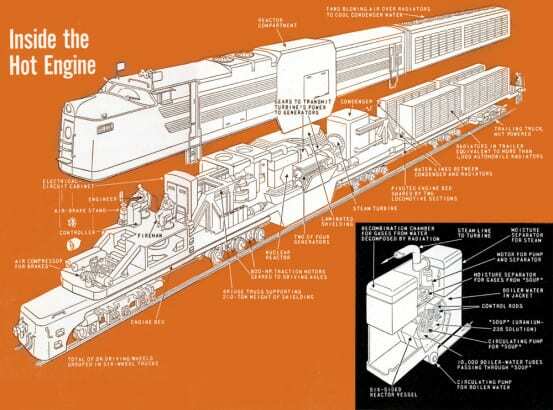 Diagram of the X-12 from Railway Age magazine, June 1954. 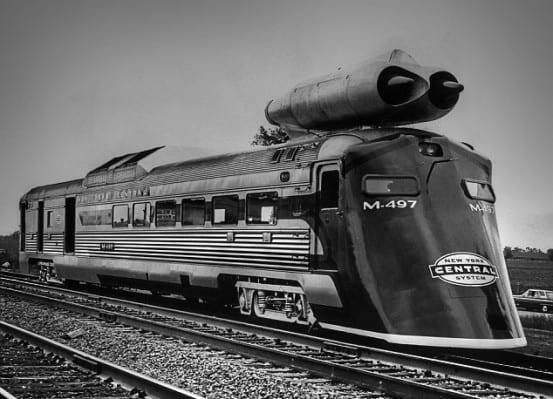 The X-12 concept locomotive was 160 feet long, and contained a cylindrical Babcock and Wilcox-designed reactor, which measured three feet in diameter and a foot long. Fueled by Uranium-235, the locomotive was designed operate continuously for several months without ever having to refuel. Hypothetically, with eleven pounds of fuel it could run for an entire year, but in practice the fuel would likely need to be changed a few times a year. In total, the X-12 locomotive would weigh 360 tons, 200 tons of which would be a protective shield from the radiation of the reactor. Behind the locomotive would be a 65 foot radiator car, required for cooling the reactor. To fit into the limited clearance required of a locomotive, unconventional machinery would be required for the X-12, designed to squeeze into tight spaces. And in order to operate such a small reactor to also fit in that space, the fuel had be highly refined, weapons grade uranium. Besides the 200 ton shielding protecting the reactor, in the event of a crash a forcible impact from any direction would cause the reactor to immediately shut down. Diagram of the X-12 from Popular Science, April 1954. Unlike the aforementioned bizarre trains, the X-12 was never actually built. Though more feasible than the atomic aircraft, the locomotive would be expensive to build – at least $1.2 million. Maintenance on the locomotive would have been very difficult, as the inner workings would have become highly contaminated with radiation. And despite assurances that the reactor would be highly protected, safety would be sketchy at most if it were ever in an accident. Safety is, of course, a very big consideration for any type of nuclear power. Though it could be argued that the effects of radiation on people were not fully known until after the dropping of two atomic bombs on Japan, we eventually learned that nausea, vomiting, diarrhea, hair loss, fever, and hemorrhaging were all hallmarks of exposure to ionizing radiation. In the optimism of the Atomic Age, many thought that these effects could be reversed, but in truth the effects of nuclear exposure were cumulative, and defects caused could even be passed on to future generations. Because of these very reasons, anti-nuclear sentiment began to spread, and the 1979 Three Mile Island accident and the 1986 Chernobyl disaster pretty much sealed the deal. Although there are many risks, nuclear power is truly a novel way of generating electricity without releasing the greenhouse gases that result in global warming, but you probably won’t see it operating your trains anytime soon. A Norfolk Southern freight passes Three Mile Island, where there was a meltdown in 1979. The two dormant cooling towers on the right are from the second unit where the meltdown occurred, which has since been decommissioned. As I understand it, the jet train was mostly a publicity stunt, not a serious plan to utilize jet propulsion. It was a one-time test only. 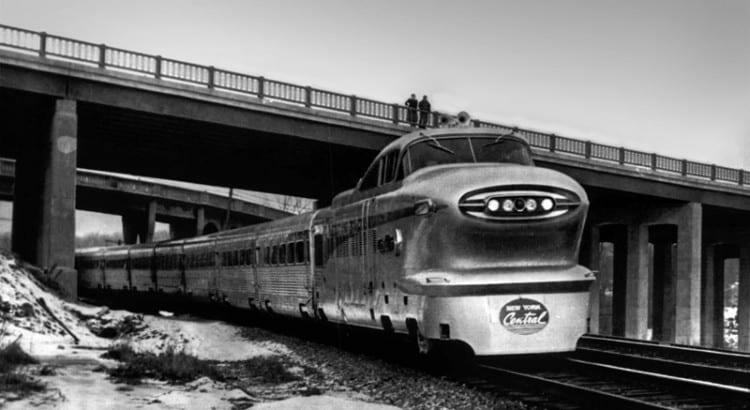 For us railroad riders today, it’s sad that many of today’s passenger trains run slower than they did in the 1950s. Amtrak has had plans on the shelf for years to speed up service by fixing bottlenecks and improving track, but Congress won’t give it the money. Yeah, it was kinda a one time thing. Alas the record still stands, so foreign countries with their high speed rail systems can poke fun at us. If I recall correctly, a Trains Magazine artical in the 1970s had the background on this stunt (and it was a stunt). I hope I get it mostly correct – forgive me if there are errors. 1) a Government official was talking to Perlman (then President of the New York Central?) and asking why 150 MPH trains had not yet been designed. 2) Perlman said it could be done at that moment with off-the shelf parts. 3) gov’t official – you don not need to upgrade the roadbed or add electrification? 4) NYC – No. Perlman then authorized the expenditure for two jet engines, a search for the correct track and an RDC (Rail Diesel Car). The traction motors from the RDC were removed. The jet engines were placed on top of of the RDC and connected. A traditional diesel pulled the jet-RDC to the start of a 1-3 mile straight track and uncoupled. When the all-clear was given, the jets were turned on and the jet-RDC was traveling at something in the 150-180 MPH speed range with no electrification, no special hardwar, and no improvement tot he track structure. The jet-RDC could not move on its own for the test and the diesel came up to couple on. I think it was tried 3-4 times on the one day. Afterwards, the RDC was converted back to its original configuration and served as a standard RDC until it retired. This stunt proved that the technology for high speed was already in existance for the govenment official. The complexity of the ex-Pennsylvania Railroads North East Corridor with electrification and all were not absolutely required and tha the cost for Jet propelled passenger train passenger service would not be cost justified from ticket sales. Interesting footnote but nothing more. Previously, my all time favorite engine was an F-unit with the SP Black Widow paint scheme. Now I have the M-497, which is like Hannibal Lector as a train… with jets! Plus I can die now knowing an engineer at some point was all, “hey, let put some mother****ing jets on a motherI****ing train!” Awesomesause with awesome and sauce left over. 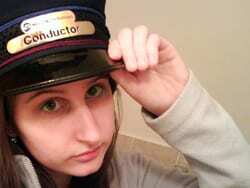 Excellent find of that nuclear locomotive. One looks like it’s riding on an Electro-Motive Division chassis, the other looks a little like the General Electric gas turbines for Union Pacific. If you want to see part of an Aerotrain, there’s a locomotive and two cars in Green Bay. I think another locomotive and some cars are in St. Louis. a General Motors bus design at the time. LWT-12,also designed by GM as well.